Effective natural deodorant with a melon and cucumber scent. Stay fresh and odour-free for longer with our super new melon & cucumber natural deodorant spray. 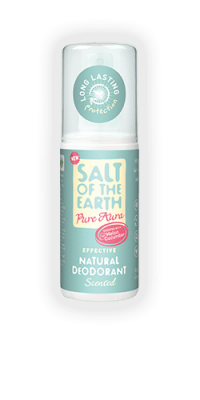 A natural, soothing, effective deodorant made with plant extracts and mineral salts. Aqua, Potassium Alum, Polyglyceryl-10 Laurate, Aloe Barbadensis Leaf Juice, Lonicera Caprifolium (Honeysuckle) Flower Extract, Sclerotium gum, Parfum*, Lonicera Japonica (Honeysuckle) Flower Extract, Sodium Anisate (from anise seed or fennel), Citric Acid. Hydroxycitronellal*, Limonene*, Benzyl Alcohol*, Citral*, Citronellol*, Geraniol*, Linalool*, Farnesol*, Eugenol*, Benzyl Salicylate*. *From natural essential oils and botanical extracts. 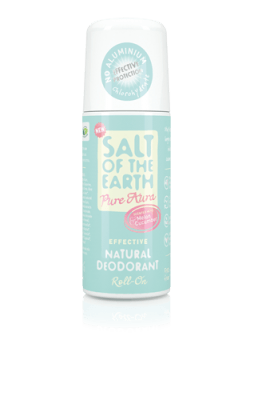 Fresh feet are only a spray away with the all new, 100% natural Foot Spray deodorant from Salt of the Earth. Containing skin-soothing aloe vera and cooling menthol, the unisex spray offers long-lasting, effective protection from foot odour – perfect for those who spend a lot of time on their feet. 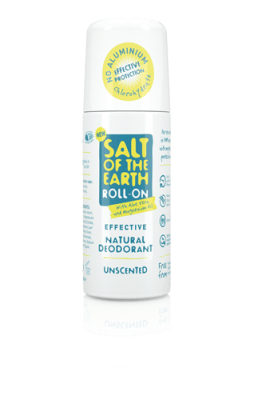 This brand new roll-on deodorant formula includes magnesium oil. Commonly known for its health benefits, magnesium oil also works as an effective deodoriser and works in-conjunction with our other natural deodorant ingredients to really up the game in our misson against body odour.